Open http://www.protectyourvision.org > click 20-20-20 > select your break schedule from the drop-down menu. You may go with 20-20-20 (recommended) or 60-5 (five-minute break every hour) or Custom (where you can choose the duration of each break and the interval between breaks). Once your break schedule is selected, click the black button labelled "Request permission and test notification" > Allow (Chrome) or Show for this session (Firefox) > Start PYV. The website requires desktop notifications because that's how it reminds you to take a break. Desktop notifications are supported on Firefox, Chrome and Safari. Now a timer will appear, showing you the time till your next break. You may disable sound notifications by clicking the volume icon next to the timer. Once you see a notification, click it and then click Start break. Now your screen will turn dark for the duration of the break. You should look at a point at least 20 feet away. Alternatively, you may click Start Eyes Gymnastics on your screen and the app shows you some eye exercises (move eyes up and down, etc.) 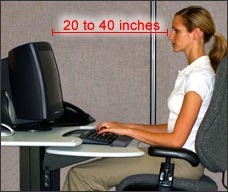 that you can quickly go through to reduce eye strain. F.lux runs in the background and adjusts your monitor's display settings to reflect the time of the day. This might make your screen look strange, but you will get used to it soon enough. It runs in the system tray, so you can right-click the icon and disable it for an hour, or for a particular app if you are doing colour-sensitive work such as image editing on your monitor. If you're watching films, it has a movie mode that makes colours look better. Cut Out The Blue Light, stimulate melatonin production to help you sleep According to the Vision Council, one of the largest groups of manufacturers and suppliers in the optical industry, blue light is one of the causes of digital eyestrain. To make your monitor eye-friendly, you can go into the settings and tweak the various options to reduce eye strain.